Leaf-miner: The larva of this species creates a gallery mine. The mine is similar to those of the alder-feeding Nepticulidae, but is generally shorter, with the larval exit-hole on the upperside of the leaf rather than the underside. After vacating the mine, the larva grazes on the underside of the leaf in the manner of other Bucculatricidae (UKMoths). Short and narrow corridor, starting at an oval, iridescent egg shell that is usually placed at the leaf underside, close to a thick vein. The larval chamber is more than three times as long as wide and is vacated through an upper surface exit slit. Frass in a narrow central black line; when the mine is made in Bog-Myrtle the thick frass line almost fills the corridor. Older larvae live free and cause window-feeding (Bladmineerders van Europa). The mining larvae have well-developed thoracic legs, that distinguish them from those of the Stigmella's mining on Alder (Bladmineerders van Europa). The larva is also illustrated in British leafminers. 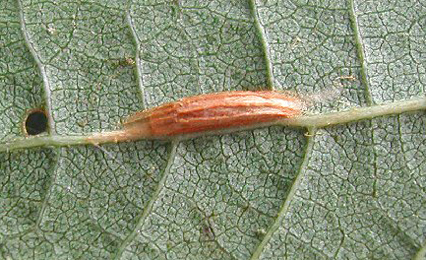 The larva pupates in a cocoon and is illustrated in British leafminers. Adult: The adult is illustrated in UKMoths by Adriaan Peeters. The species is included in mothdissection.co.uk. Time of year - larvae: August and September (UKMoths; British leafminers). Time of year - adults: May and June, sometimes with a second generation in August (UKMoths). Distribution in Great Britain and Ireland: Distributed widely across much of the British Isles, though not always common (UKMoths), including Hampshire (Fleet), Suffolk (British leafminers); Anglesey, Breconshire, Caernarvonshire, Cambridgeshire, Cardiganshire, Carmarthenshire, Cheshire, Denbighshire, Derbyshgire, Dorset, Dumfriesshire, Dunbartonshire, Durham, East Cornwall, East Kent, East Norfolk, East Suffolk, East Sutherland, Glamorgan, Huntingdonshire, Isle of Wight, Main Argyll, Merionethshire, North Aberdeenshire, North Somerset, Pembrokeshire, Shropshire, South Aberdeenshire, South Hampshire, South Northumberland, South Wiltshire, Stafford, Stirlingshire, Warwickshire, West Cornwall, West Norfolk, West Suffolk and Westmorland and Worcestershire (NBN Atlas) and Ireland (Karsholt and van Nieukerken in Fauna Europaea). Distribution elsewhere: Widespread in continental Europe including Austria, Belarus, Belgium, Croatia, Czech Republic, Danish mainland, Estonia, Finland, French mainland, Germany, Hungary, Italian mainland, Kaliningrad Region, Latvia, Lithuania, Macedonia, Norwegian mainland, Poland, Romania, Russia - Central, East and Northwest, Sardinia, ? Sicily, Slovakia, Sweden, Switzerland, The Netherlands, Ukraine and Yugoslavia (Karsholt and van Nieukerken in Fauna Europaea).